Write what you know: Mark Batterbury, now a professional astrologer based on Canada’s west coast, took that famous credo to heart when he left writing school at the cultural peak of the 1960s in hot pursuit of truth and enlightenment. Three eventful decades later, Batterbury delivers a richly detailed memoir that documents his wayward pilgrim’s progress to spiritual understanding. As the years unfold, giddily intense periods of bliss and satori are followed by disillusionment, dark depression and eventual peace as the author makes a full-circle trek back to his flawed human self. Eager to transcend a painfully orthodox childhood, Batterbury joined his generation’s wave of “dharma bums” and headed east with nothing but an open mind and questing soul. His anecdote-laced autobiography includes encounters in India, Nepal, Thailand and elsewhere with such luminaries as the Dali Llama, Swami Muktananda, S.N. Goenka, Mother Meera, the Karmapa Lama and Ashtanga yoga master Pattabhi Jois. Back home in the west, he goes on retreat in the English countryside with noted Buddhist teachers Christopher Titmuss and Andrew Cohen, then begins life-changing studies with evolutionary astrologer Jeffrey Wolf Green. Rather than a dry recounting of meetings with remarkable men, Batterbury vividly captures the alternately harsh, humourous and ecstatic details of life on the spiritual path. The everyday rhythms of Varanasi, Dharmshala and Ganeshpuri. The profound pleasure of a fresh cup of hot chai. The unforgettable sight of thousands of butter lamps lighting the temple at Bodh Gaya. The cleansing torment of the sun dance and the charged ritual space of the sweat lodge. Riding the tailwind of the ‘60s, a free spirit finds his own brand of enlightenment while encountering gurus, personal demons and such luminaries as Swami Muktananda and the Dali Llama. Born in England shortly after the Second World War and raised in Victoria on Canada’s far west coast, Mark Batterbury has walked the path least taken throughout his adult life. He has lived in ashrams throughout India, homesteaded on Saltspring Island, meditated on the beach in Goa and built his own humble cottage in the shadow of the Himalayas. He now resides with his dog Tooka on five forested acres beside the Sooke River on Vancouver Island's west coast of Vancouver. A near-fatal climbing accident on Mount Arrowsmith gave the 16 year-old his first hint that there was more to life than sports and runaway hormones. After studying creative writing at the University of Victoria, he travelled to Mexico in search of peyote wisdom, then made the first of many extended trips to India that in total have added up to 12 full years on the subcontinent. 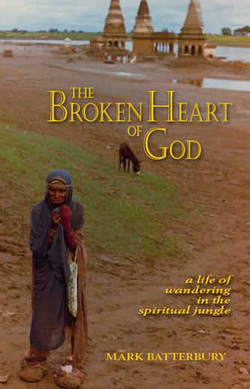 The Broken Heart of God chronicles Batterbury’s quest for enlightenment, subsequent depression when it proved elusive, and mature understanding that ordinary human life is both sacred and wonderful in and of itself. His spiritual practices are now grounded in nature, particularly the native American tradition of the sweat lodge. The first graduate student of renowned “evolutionary astrologer” Jeffrey Wolf Green, Mark is a professional astrologer himself (www.plutoastrology.com) who offers phone consultations to clients in North America and overseas.